For a certain generation, of which I reluctantly admit to belonging (but only just), the name, or at least the phrase, ‘Wild Child’ conjures images of the movie Easy Rider with Peter Fonda, Jack Nicholson, Dennis Hopper, Harley-Davidson choppers, American flag-adorned leather jackets, buckskin pants, marijuana, Jimi Hendrix and Steppenwolf. Sunseeker’s Wild Child isn’t that. 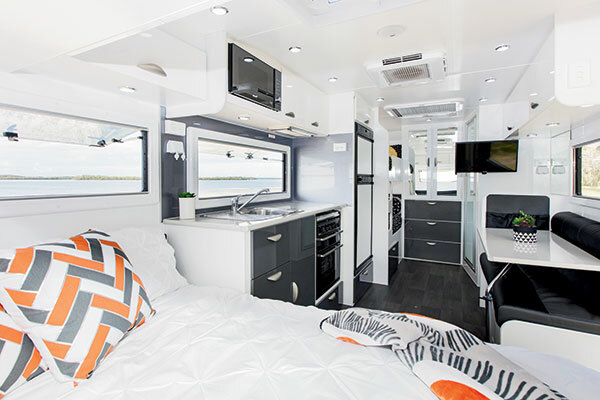 And as I watched Sunseeker’s Chris Michel and his wife Belinda lay on a rug in front of the van playing with their children Emily and Harrison, the thought vanishes with the gentle sea breeze. 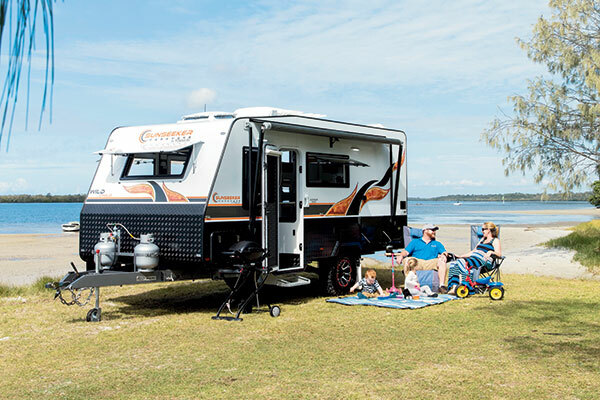 While its burnt orange flame decals offer the suggestion of a wild time, this van is all about getting out and about, trying the road less travelled with the kids. The 5.5m (18ft) offroad Wild Child is an aluminium-framed van with composite panel sides and fibreglass roof, marine hatches to all outside storage compartments, Dometic awning, LED lighting, stoneshield covering on the front window, tunnel boot, storage boot, and a fold-open generator storage box. However, they don’t tell the offroad story of the Wild Child. It’s the SupaGal chassis, made with 3mm-thick Australian RHS steel, 150mm drawbar with 100mm chassis rails, offroad trailing arm coil suspension with twin shocks and chunky mud-terrain tyres with load-rated alloy wheels, the tried-and-true Vehicle Components Hitchmaster DO35 full offroad articulating coupling and four-bar rear bumper that really make offroad travel a serious option with this rig. What’s more, its Tare weight of 2000kg and ATM of 2700kg mean there’s plenty of options when it comes to matching this rig with the right tow vehicle. That’s pretty good for a family-size offroader! There’s very little point in finding your way to your hideaway holiday unless you can accommodate the whole family. The Wild Child we looked at boasted two bunks for the kids in what is quite a stylish interior with plenty of storage throughout. And, like the Golden Child, the front of the van featured a comfy east-west caravan-queen-size bed. As I loathe snagging my fingers on a badly made drawer or cupboard shelf, it was nice to see that the quality cabinetry finish that I saw in the Golden Child continued into this van as well. For those that love to spend time in the kitchen, ample LED lighting makes preparing your cordon bleu cuisine all the easier while an acrylic kitchen splashback helps keep the walls tidy. That’s a good thing if you tend to splash the spaghetti sauce a little bit when stirring the pot. As for enjoying your meal in the dinette, for my money, this is probably the Wild Child’s weak point. The van is compact for a family van, with available living space generally well thought out. However, the dinette is arguably a little small for a family of four or five – not an uncommon complaint in a family van, by any means. And, given camping with kids is about enjoying the great outdoors, there’s always the option of feeding the clan outdoors under the awning if you really need a little more space. 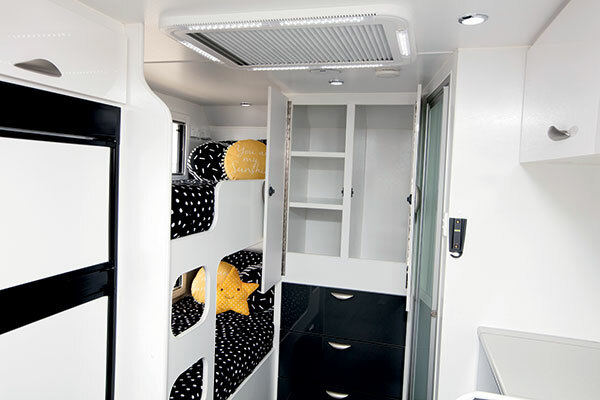 Storage-wise, there’s plenty, with overheads above the windows and deeper overheads above the bed plus under-bed storage under the bunks and main bed. If you run out of storage in and around this van, you really have too much stuff – leave some behind. 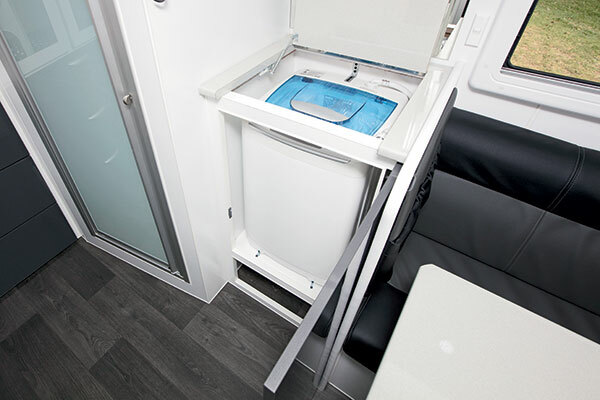 Water capacity is key to setting up camp off-grid and staying there, and the Wild Child will help keep your clothes smelling fresh, with an under-bench washing machine nicely hidden within the kitchen. And while your plumbing also includes a gas/electric hot water system and a Thetford cassette toilet, you have just 190L of water spread over two tanks. An additional, dedicated, drinking water tank wouldn’t go astray here, I thought. Especially if you need to shower, feed and hydrate four or five people, compared to just two. Nonetheless, it’s likely to have you covered for at least a few days of free camping before you have to head into town for a drink or a shower. And keeping to a lower water capacity saves weight without hurting the family camping experience. If free camping or going off-grid is your thing, then you’ll need sufficient power. The Wild Child carries one 120Ah AGM deep-cycle battery and one 150W monocrystalline solar panel with a 30A solar regulator. Although it’s not quite a clear-cut argument, given a choice between monocrystalline and polycrystalline solar panels, monocrystalline is best. So that’s a plus. 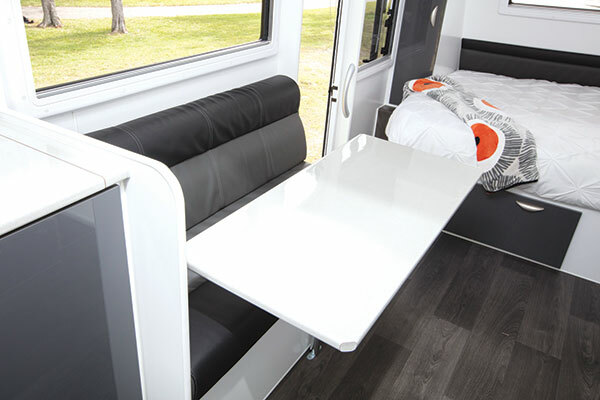 Although there’s only one panel, it has only one battery to charge and it straddles that fine line in balancing a caravan’s weight, space, cost and need. Consequently, the Tare weight and cost are both lower than you’d expect for a family offroader. As family vans go, Sunseeker’s new Golden Child has a lot going for it. With a Tare weight of 2250kg, a medium-sized SUV will handle towing duty. Better still, an ATM of 2900kg means you’ve got plenty of capacity for a full load of water and plenty of odds and ends for the kids. 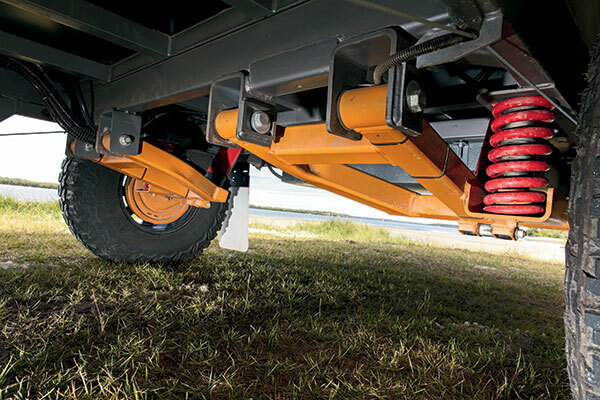 Add in a modest ball weight and tandem axles and it doesn’t just look the part, it’s also set to tow well down the highway. If you’re looking to take the family offroad, the Sunseeker Wild Child is worth considering. Not too heavy, with quality suspension and a sturdy build, quality finish and, like its cosmopolitan cousin the Golden Child, the Wild Child is a handsome beast to boot. 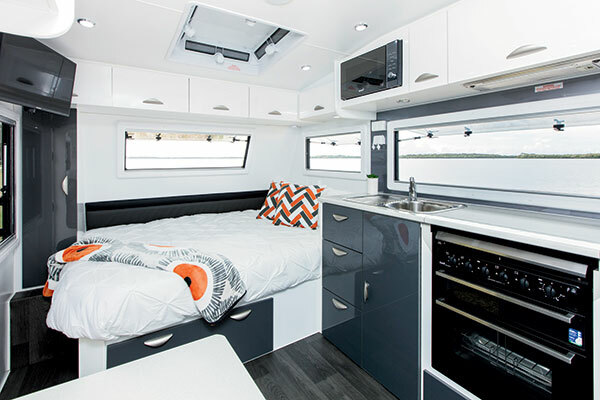 This family van offers pragmatic and well-priced caravanning, each with ample storage space for all of the family’s bits and bobs.